NOTE: This module no longer requires the YouNetco core module to function and operates 100%!!! Standard SE Member Profile Page looks so boring; member cannot do anything with it. The best way to encourage your members to keep coming and staying on your site is to allow members to change their appearances with background, text color, menu link, etc., colorize the community. 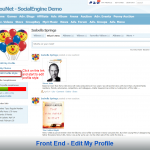 User Profile Styler is exactly the tool for that. Your member will be able to change their profile’s background, widget, menu bar, tab bar, text and link. As an admin of the community, you should define some default templates and new comer will be so happy to select one. Also, if you would like to allow some certain member levels only, “Member level settings” will help you. This module no longer requires YouNetCore plugin to verify license. P.S. 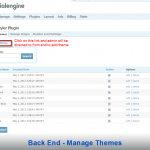 This module is truely nulled like all other nulls provided by MisterWizard. You do not have to join a "Fan Club" to get most modules provided by MisterWizard! MisterWizard is: You, I, Anyone, Everyone! Because: We are Legend... We are many... We are outside the realm of possibility! I'm gonna try this one, thanks! well thanks bro for uploading.. hope it works.. Does anyone know if there is an upgrade for this plugin? Please @Les if you can provide this plugin compatible with SE 4.10.3 php 7, we really appreciate your help. Edited by kreator, 15 April 2019 - 03:07 PM.